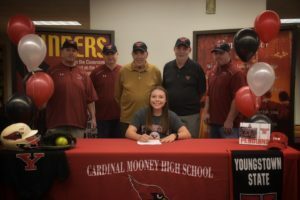 (November 19-Youngstown, OH)-On November 16th, Cardinal Mooney High School Senior Softball Standout Conchetta Rinaldi signed a Letter of Intent to play under scholarship with the Youngstown State University Penguins for her Freshman season. Conchetta is the daughter of Tony and Pam Rinaldi of Boardman. She is a four-year starter and letter winner for the Mooney Cardinals Softball Team. Conchetta holds Mooney Softball records in Single Season Home Runs, Career Home Runs, and Career RBIs. She has been an in integral member of the District Championship Team of 2017 and District Runners Up of 2018. In addition, Conchetta is a member of National Honor Society, an Academic Letter Winner, a member of Hospitality Team, YES Fest, Link Crew, and Service Club. She is also a four-year letter winner in Basketball.